If you’ve got a job to do in the vicinity of Lake Charles but don’t have the right equipment, consider renting it from Louisiana Cat. We’re a fully authorized Caterpillar® dealership near you with a well-stocked inventory of Cat® machines, engines and generators. Located close to Interstates 10 and 210 and just off U.S. Route 90, Louisiana Rents in Lake Charles is the only stop you need to make for construction equipment rentals, parts andservice. Every day, our team lives up to the reputation Louisiana Cat has built as a trusted leader in construction equipment for more than 85 years. That means when you need equipment for a short- or long-term project, or if you quickly need a replacement piece in the event of a breakdown, our rental staff appreciates the pressure you’re under to get the job done right. 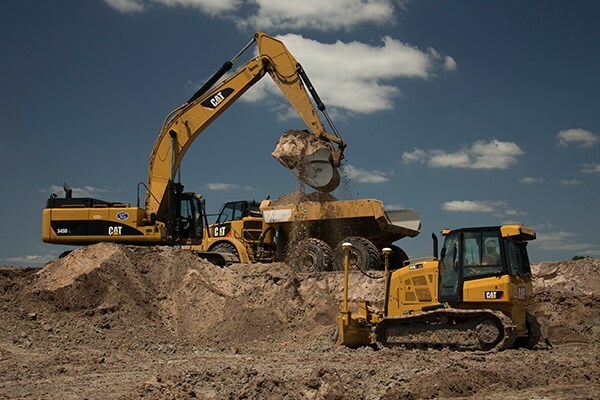 All our Cat equipment, as well as machines from other top brands from allied vendors, is always in top shape, since each piece is well maintained by our in-house, factory-trained technicians. So you get more uptime instead of hassles, sales pitches and complicated rental agreements. Of course, factors like the length, location and type of job can all have an impact on the kind of equipment you want to rent. And since our staff knows construction, you can also count on their help to get exactly what you’re looking for. Don’t settle for second-best when it’s your reputation on the line. Training courses: Maybe it’s the basics you need, or perhaps a refresher course. When it comes to learning about the safe operation of equipment, you’ll find just what you need in our Operator Training Catalog, complete with a list of training courses, full descriptions and clear instructions on how to enroll. 24/7 emergency service: Breakdowns can be costly when they eat into your uptime. But with our 24/7 emergency service, all you have to do is make one call and a fully-equipped field truck with a factory-trained technician will be on its way. Sizable fleet: From compact to heavy-duty equipment, you have choices at Louisiana Rents in Lake Charles. And our equipment is fully loaded with the latest innovations and technology to help you make the most of your rental. Convenient rental terms: With 10 Louisiana Rents locations across the state, you can choose when and where to pick up and drop off rental equipment. Plus, if your schedule or the job you’re working on changes and you need to adjust your rental dates, just contact us and we’ll do all we can to assist you in rescheduling. Lake Charles Louisiana Rents Location Means Affordable Convenience Right At Home! At Louisiana Cat Rentals in Lake Charles, we know you’ve got both a schedule and a budget. Let our knowledgeable staff and wide inventory help you stick to both.